In heavily regulated industries such as the energy industry there can be some unique challenges to technology adoption. In this podcast we interview Tim Custer, Senior Vice president – North America land, business development and real estate with Apache. 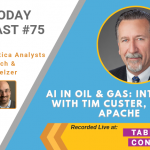 We discuss how AI and ML technologies are being used to extract valuable information from unstructured content, how Apache is leveraging AI technologies to help with a variety of tasks such as contract review, some unique use cases for AI and ML technology, and more!